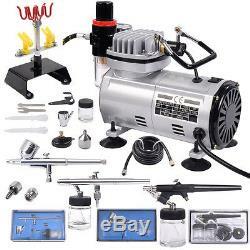 New 3 Airbrush & Compressor Kit Dual-Action Spray Air Brush Set Tattoo Nail Art. 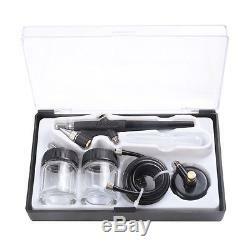 Here comes a new brand Airbrush Kit with 3 Airbrushes and High Efficiency Air Compressor!! It is perfect for your spray painting art, also for nails & temporary, tattoos, cake decorating, craft painting, hobbies, commercial arts, illustrations, photo retouching and other airbrushing!!! 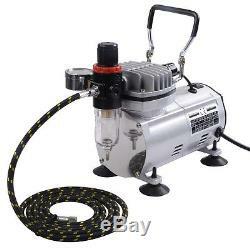 This High Performance compressor has been designed for users who need high quality spraying effect. Using this item, it is believed that you can get from a beginner to become an advanced artist. So don't hesitate, just take it home!! Air pressure gauge, Air filter, Pressure and adjustable. Start with pressure, continuous working, powerful. Auto star and auto stop function. Suitable Color Fluid: Watercolor Pigments, Inks and Dyes, Acrylics. Great Starter Airbrush for Beginners and Students. Auto turn off when over heated. 28 Removable Needle and Nozzle Cap to help spray at full range effects. 1x 0.35mm N0.28P Airbrush. Dual-Action Siphon Feed Airbrush with one 5cc Color Cup and one 22cc Siphon Feed Fluid Bottle. 1x 0.3mm N0.30E Dual-action Airbrush. Precision Dual-Action Gravity Feed Airbrush with a 7cc gravity fluid cup. 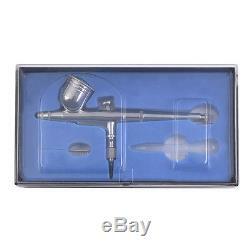 1x 0.8mm N0.38 Single-action Airbrush. External Mix Siphon Feed Airbrush with two 22cc Siphon Feed Fluid Bottles. 1x 4-Airbrush Holder (Free Gift). 3x Storage Cases for Air Brushes. Instructions for Air Brushes & Compressor. Factorydirectsale is a leading and emerging company in manufactory and exporting business. Our company is specialized in Pet Products, Sporting Goods, Home Garden for more than 10 years. If you need to return, please check twice to confirm the item not work and contact our customer service representative, let us know the detailed problem and send us some pictures for confirmation. You bought wrong model or wrong color. We ONLY accept the return for original package. Please make sure that item has NO man-made sabotage. Used items will not be accepted for return. We are located in Rancho Cucamonga, CA 91730. We will give you a response in 24 hours. All emails will be responded to within 12-24hours. You need to change your order ex. You want to check/help track your package. If you need further assembly instructions for a product. Any other unspecified questions or concerns. A: The item ships from Rancho Cucamonga, CA, United States. A: Please log on your account. Q: How do I return an item? Please contact our customer service before you return an item. The item "New 3 Airbrush & Compressor Kit Dual-Action Spray Air Brush Set Tattoo Nail Art" is in sale since Tuesday, June 10, 2014. This item is in the category "Crafts\Art Supplies\Airbrushing". The seller is "factorydirectsale" and is located in Rancho Cucamonga, California.